My friend John Stowell showed me this arpeggio many years ago.He has been playing these sounds coming from Melodic Minor scale for decades. I have been in love with this device for the first time that I listened t.
Because I love wide intervals its fit perfect to me. Arpeggios are great for avoid scales, if you take a close listen to mostly Jazz and Fusion masters like Allan Holdsworth, Wayne Shorter ,Herbie Hancock, and John Coltrane, they don’t use scales.They use arpeggios, triads and other more ceative patterns with wider intervalls than minor or major second. Using only one kind of arpeggio looks weird but it works well.Because the Minor Maj 7th sound represents not only the Melodic Minor, if not also the Harmonic minor, also the fourth mode of Harmonic major scale, and The Simmetrical augmented scale. 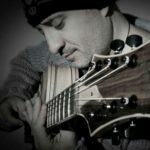 In this video lesson I’m tried to explore all the possibilities coming from the previously mentioned scales.Besides that, I teach another devices that I play like string skip’s patterns and my invention “the borders of the position’s scale” among triads from each scale plus examples using original arpeggios mixed with the new one Minor major 7th.